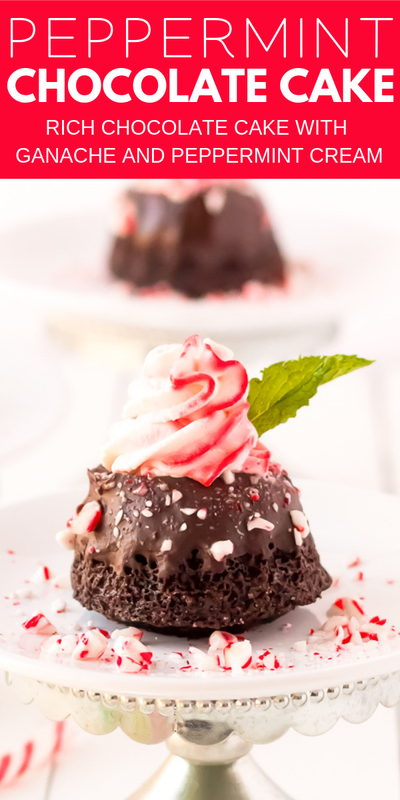 These Mini Chocolate Peppermint Bundt Cakes are a rich, decadent single-serve dessert made with cocoa powder, coffee, and topped with peppermint whipped cream, these treats taste like a coffeehouse favorite! 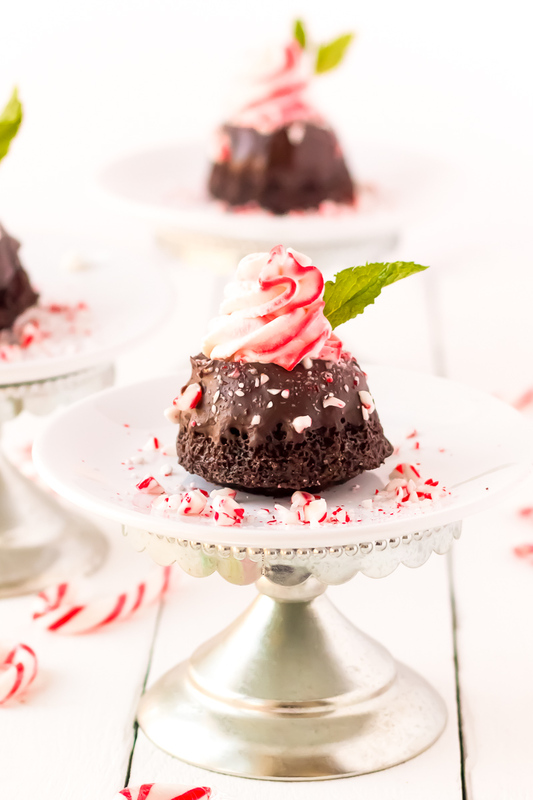 These Mini Chocolate Peppermint Bundt Cakes are the decadent “me time” treat you need this holiday season. 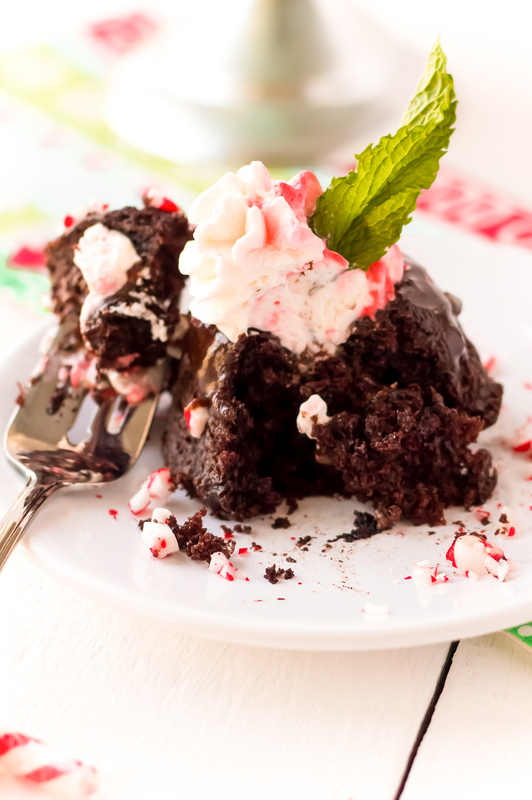 Rich, scrumptious, and made in single portions, this Peppermint Chocolate Cake recipe is totally delicious! In fact, these tasty treats remind me of one of my favorite Starbucks drinks: Peppermint Mochas! That’s because this recipe calls for a cup of freshly brewed coffee — gotta love that caffeine kick. Needless to say, this sweet snack is amazing when paired with a steamy mug of coffee or a frothy latte. Talk about an afternoon pick-me-up … or a great way to start your day! 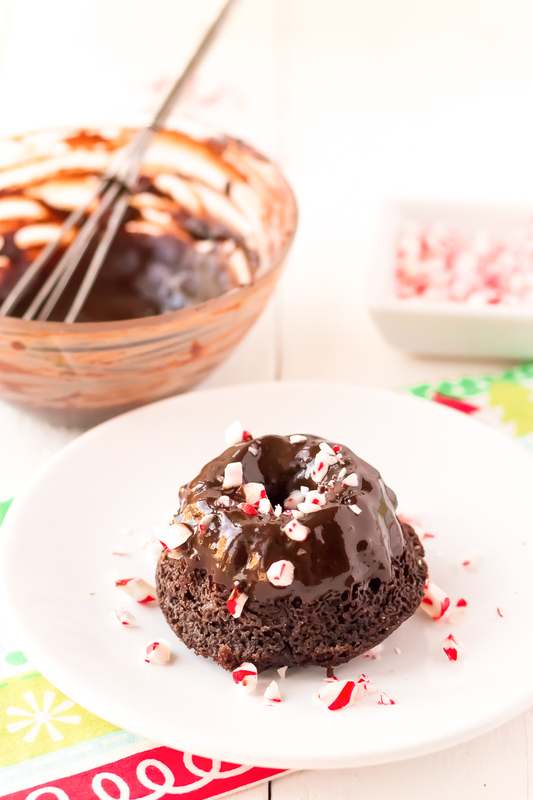 Chocolate Peppermint Bundt Cakes Are Rich And Delicious! 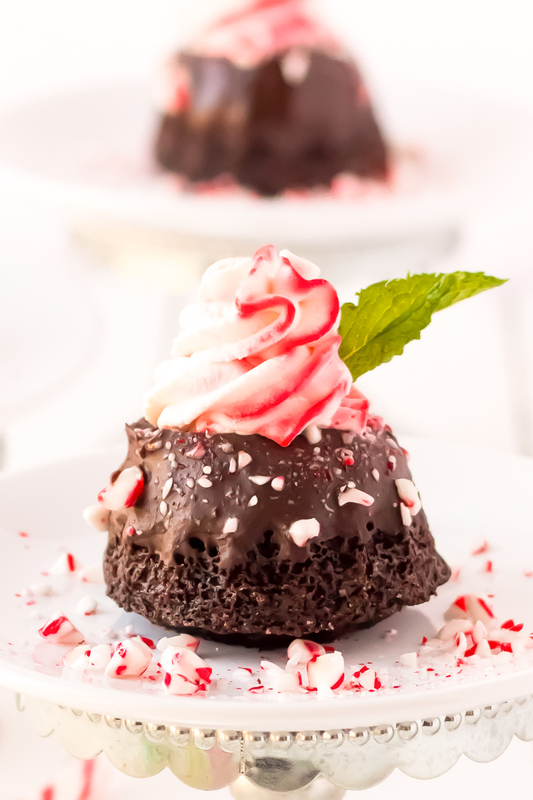 In addition to coffee, Mini Chocolate Peppermint Bundt Cakes call for a hefty dose of cocoa powder. They’re made extra moist with an unexpected ingredient – buttermilk – and topped with a rich chocolate ganache. Yep, let’s talk about that ganache. It’s super easy but super tasty, made with heavy cream and baking chocolate — that’s it! Don’t forget to use a mini bundt cake pan! Mini Bundt Cake PanBuy Now! The final layer is a light, frothy peppermint whipped cream that ties everything together! Just add a few drops of peppermint extract and red food coloring to my Perfect Homemade Whipped Cream recipe. Voilà! 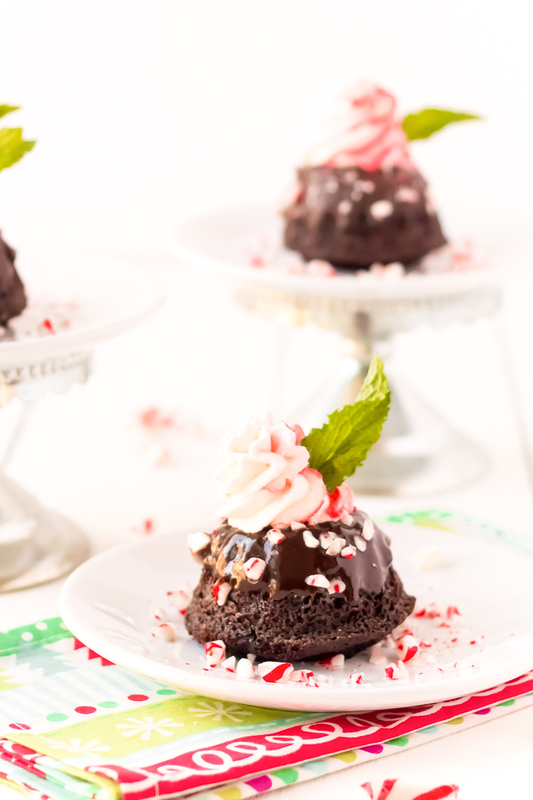 You’ve got a festive dessert topping for your Mini Chocolate Peppermint Bundt Cakes! The finishing touch is some peppermint chips or crushed candy canes sprinkled on top. 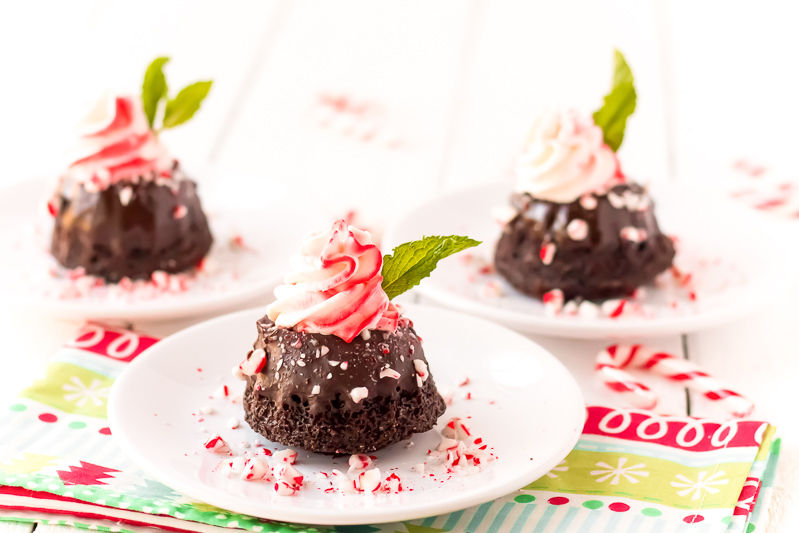 As mentioned, these mini Peppermint Chocolate Cakes are a scrumptious pick-me-up when you need a break. But they’re also perfect to serve at dinner parties; everyone will love getting their own mini dessert! If you or a loved one can’t eat gluten, you can easily make these to accommodate allergies or sensitivities. Simply substitute an equal amount of gluten free all-purpose flour for regular flour. This Peppermint Chocolate Cake recipe is perfect to whip up when you’re in need of a festive indulgence. Make a batch to share, or savor them all for yourself (I won’t judge!)! This recipe was originally published in November 2014 as a gluten free cake, new photos, content, and recipe adjustments were made in December 2018. 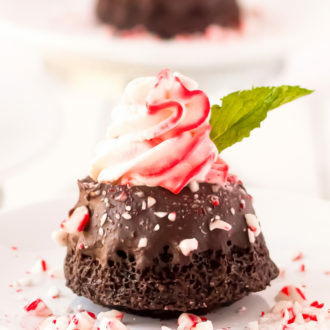 Mini Chocolate Peppermint Bundt Cakes are a rich, decadent single-serve dessert made with cocoa powder, coffee, and topped with peppermint whipped cream, these treats taste like a coffeehouse favorite! Preheat oven to 350 degrees F and grease a mini bundt pan with butter or cooking spray and set aside. Whisk together flour, cocoa, sugar, baking soda, baking powder, and salt in a large bowl or stand mixer. In a separate bowl beat together buttermilk, oil, eggs, and vanilla with a fork. Slowly add the wet ingredients to the dry ones while mixing on low speed. Keep the mixer on low speed and slowly add the coffee into the batter. Scrape down sides and mix until fully combined. Batter will appear very runny, this is normal. Ladle (or pour if you're just that good) batter into the bundt cake molds about 3/4 of the way The cakes do not rise much. Bake for 12-14 minutes until toothpick comes clean. Remove from oven and let cool in pan for a few minutes before flipping onto a cooling rack. Repeat until batter is gone. Heat heavy cream in a saucepan until it begins to simmer. While cream is heating, chop up baking chocolate and place in a small glass bowl. Once the cream is heated, pour it over the chocolate and let it sit for two minutes, DO NOT STIR. After it sets, beat with a whisk until a rich chocolate ganache forms. Let sit for a couple of minutes and then dip the tops of the cooled cakes in and set aside to cool. The whipped cream should be prepared right before serving. Follow the instructions of my Perfect Homemade Whipping Cream and add in peppermint extract. Put together a small star tip and pastry bag and drop a few drops of food coloring into the bag. Add whipped cream into the bag and pipe into the center of the bundt cakes. I use this Mini Bundt Cake Pan, baking times may vary with larger cavity pans. Cake Recipe Slightly Adapted from Ina Garten. YUM!!! These look absolutely incredible! And Bobs Red Mill, LOVE their stuff!!!! They have everything a food lover could need! Yes, they do! I love their products too, especially the flours, oats, the flaked coconut! These look wonderful and so festive. I love finding gluten-free recipes. Thanks. Shared and pinned. This flour makes gluten free so easy! Thanks so much for stopping by! It is NEVER too late for something that looks this amazing! Love the photos, and Bob’s, and these look so good!! Thank you, Heather! You can’t go wrong with Bob’s products! Delicious! Instead of individual mini cakes, I made one large bundt and it was a hit. Thank you!